Barnsley crashed to their eighth straight defeat in League One as they lost at home to Port Vale. After early Barnsley pressure, goals from Ajay Leitch-Smith and Sam Foley put Vale well on their way to victory. Leitch-Smith headed in a looping cross five minutes before the break before Foley found the top corner after the restart following Bryon Moore's run. Substitute Sam Winnall pulled a goal back late on for Barnsley, who slipped to second bottom in the table. Barnsley's last league win came at home against league leaders Gillingham on 26 September. Match ends, Barnsley 1, Port Vale 2. 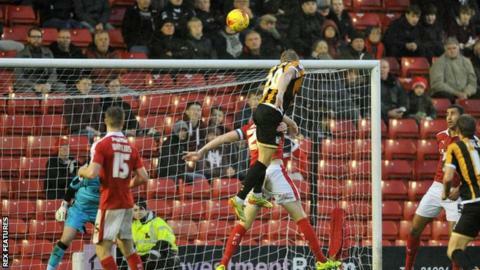 Second Half ends, Barnsley 1, Port Vale 2. Corner, Barnsley. Conceded by Ryan McGivern. Attempt missed. Conor Hourihane (Barnsley) left footed shot from outside the box misses to the right. Substitution, Port Vale. Colin Daniel replaces Sam Foley. Goal! Barnsley 1, Port Vale 2. Sam Winnall (Barnsley) right footed shot from the centre of the box to the bottom right corner. Attempt saved. Michael Smith (Barnsley) header from the centre of the box is saved in the top left corner. Attempt missed. Sam Winnall (Barnsley) header from the centre of the box is too high. Substitution, Port Vale. Uche Ikpeazu replaces A-Jay Leitch-Smith. Substitution, Barnsley. Michael Smith replaces Lloyd Isgrove. Corner, Port Vale. Conceded by Lloyd Isgrove. Attempt missed. Conor Hourihane (Barnsley) right footed shot from the centre of the box misses to the right. Substitution, Barnsley. Sam Winnall replaces Ivan Toney. Goal! Barnsley 0, Port Vale 2. Sam Foley (Port Vale) left footed shot from the centre of the box to the top left corner. Assisted by Adam Yates. Corner, Barnsley. Conceded by Sam Foley. Second Half begins Barnsley 0, Port Vale 1.